I’ve always believed that everything happens for a reason, but sometimes you need a “slap in the face” to remind you. 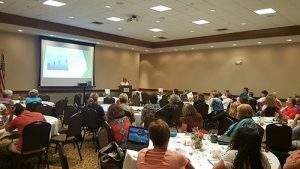 Months ago, I decided to come the Women’s Council of REALTORS Region 1 Conference in Roanoke, West Virginia. As the planning began, I realized that the location was a little difficult to get to from Texas, and decided that my family should use this as a vacation/business trip. We could all use some more quality time together as family, couldn’t we? The family was super excited as the resort has an amazing golf course, so they would get to spend their days doing their favorite thing while I was in meetings, doing mine 😊. As we left Texas on Friday morning around 4 am, I wasn’t happy. I was flat-out not excited about the 22- hour road trip ahead of us, all four of us crammed in a rental mini-van. To my most pleasant surprise, the trip was not nearly as bad as our last big road trip when the boys were younger. 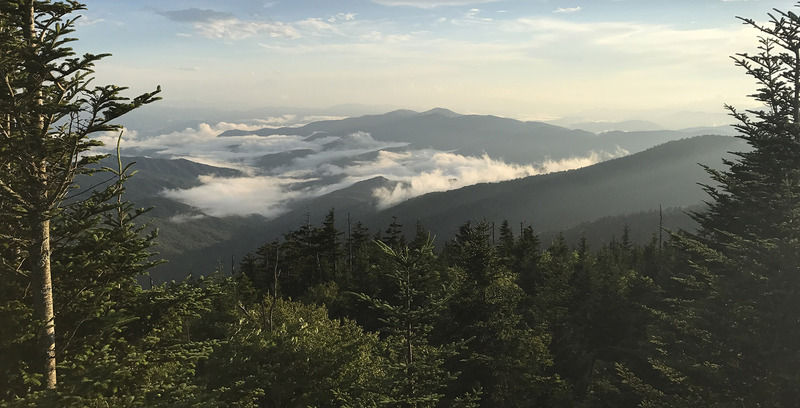 During the drive, I was amazed by the beauty of our country – something that I never would have experienced had I flown to West Virginia. This whole concept of campaigning and meeting people is actually really foreign to me. I’m an introvert by nature, so I knew my apprehension was heightened by the knowledge that I would know only a handful of people at the convention. As with any conference, you can expect to have a few “Ah Ha” moments, but as I reflect on the Region 1 Conference, I can honestly say every part of it was enlightening. It’s impossible to capture the whole conference in one blog entry, but I’d love to share a few moments with you. Remember, I am an introvert so talking to strangers can be difficult. During the networking reception, I walked past a woman with a Women’s Council Logo shirt. All I could read from my vantage point was “Virginia,” so I asked if she was Virginia or West Virginia. I’m not even sure why I would ask that question, other than this trip was my first time to see either state, and they were both absolutely gorgeous. Whatever the reason, that’s what I asked, and because I did, I met Toni, and we became instant friends. During that conversation with Toni, we discussed many things, but probably the one that stuck out the most is that as a new state network, West Virginia needed some ideas of networking activities that aren’t necessarily always just a social hour. I gave her some suggestions of things I have either participated in or have heard about before. I feel like she received great value from the little brainstorming session, but for me it was an especially enlightening experience. I realized this was actually my favorite part of Women’s Council… the relationship building, and the sharing of ideas. It probably seems insignificant to someone that doesn’t understand what it’s like to be the one in the corner of the room, too shy to say anything to anyone, but for me, it was a huge milestone that has come piece-by-piece through the years from my involvement with Women’s Council. The next “Ah Ha” happened the following night during the dinner. I was attending the dinner while my family was alone in the hotel room. At the dinner, they had a Blue Grass band playing, and the wonderful attendees were trying to get them to play a Texas Blue Grass song for me. I can’t even begin to express the warm hospitality I felt from Region 1. As the band was wrapping up, I asked my family to come down and see the band. The attendees were so warm and welcoming to my family. They were closing the area where we were at the hotel so we all made our way over to the fire pit. They embraced my family just as they had embraced me. My boys were literally making s’mores for everyone. I really had the warm fuzzies going, feeling all the love for me and my family. 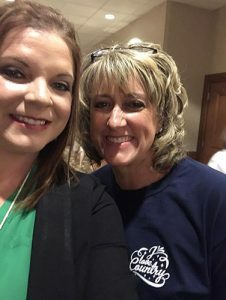 As I was headed back to join the group after a quick visit to another group of people, I passed Cheri, a local WCR member I met during the conference. Our quick conversation came around to the fact that she wanted to continue moving up and serving in Women’s Council, but she was feeling the resistance from her husband because she has a teenager at home. 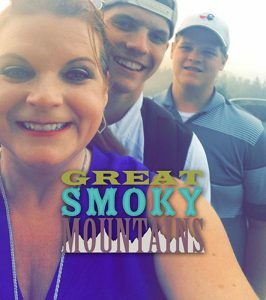 I asked if she wanted to come meet my family… my husband and 2 teenagers that were around the fire pit with a huge group of WCR members. She did meet them. We, as women, wear many hats. It doesn’t mean that I necessarily take off my mom or wife hat to volunteer in Women’s Council. They can be incorporated together and it can be beautiful. My family has been invited to come stay with many of the people we met at the Regional Conference because the relationships we build don’t stop with us, they extend to our family too. I look forward to seeing Cheri’s leadership in Women’s Council for many more years! My final “Ah ha” (or at least the one I’ll share today!) was during the lunch. 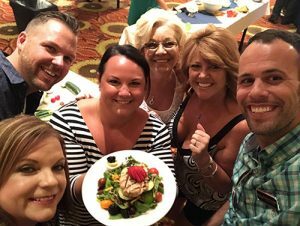 We had just finished a salad “cooking” contest, and my team, “Hot Mess Express,” took 2nd place honors. As we were eating lunch, I had the opportunity to talk to some ladies I had not previously spoken with. I was encouraging them to attend other Regional Meetings. I used myself as an example to them. I was the only person from Texas for the 3-day conference. If any of the 100 attendees have a referral for Texas, who will they call? They’ll like call me. They know me. They’ve had interactions with me. Now, Texas is a huge state. So, if they call me, it’s likely I won’t be able to help their client. But I will pass on that referral to the best REALTOR in ________, Texas… the exact same person I would send my personal referral to. I believe in karma… I have actually seen it in this exact scenario. In one year, I passed more than 30 referrals to other Realtors in Texas. Then in one week, I received 3 referrals from the same Realtor. Karma. I attended this Regional Conference because I’m a candidate for 2018 National Treasurer, but that rarely came up at all. I’m definitely not a politician, but I am me, and that’s what I do best. I pushed myself to meet new people and my life will be forever changed by the amazing relationships I formed. My family allowed Cheri to see she doesn’t have to choose one hat to wear and she very well may be a future National Women’s Council President or wherever she goes because being a leader doesn’t mean just being a leader in one area of your life. An entire table of ladies are thinking of attending other meetings, not just for personal referrals but that they also may be able to bless others with the relationships they build. So my very negative attitude about driving across country was turned around… I was truly blessed to be able to drive across this beautiful county. I am forever changed!